The iPhone revolutionized how we access the internet and use our mobile devices. When we are not at our desks and in front of computers, the iPhone has become the primary way we view and manage our email. With the introduction of iOS 9, the latest operating system for the iPhone, Apple has added a new feature to the Mail application which you should be aware of. There is now a “Trash All” button which shares the same location as the normal “Trash” button and as the name implies, has the ability to send an entire folder of email into the trash with one touch. This feature can be helpful in certain situations, but it is also capable of deleting your entire inbox with an accidental mis-tap of the phone. 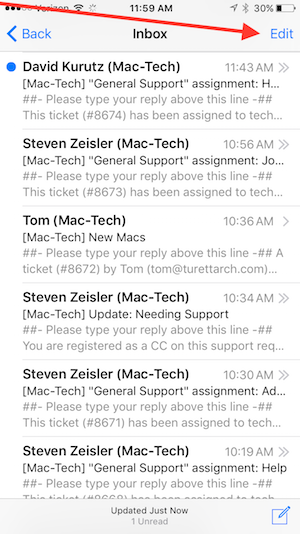 Lets take a look at this new feature works so we can potentially avoid some email related headaches. The “Trash” and “Trash All” buttons are located in the edit menu of the Mail application. To access the edit menu, tap the “Edit” button in the the top right hand corner of the Mail Application.